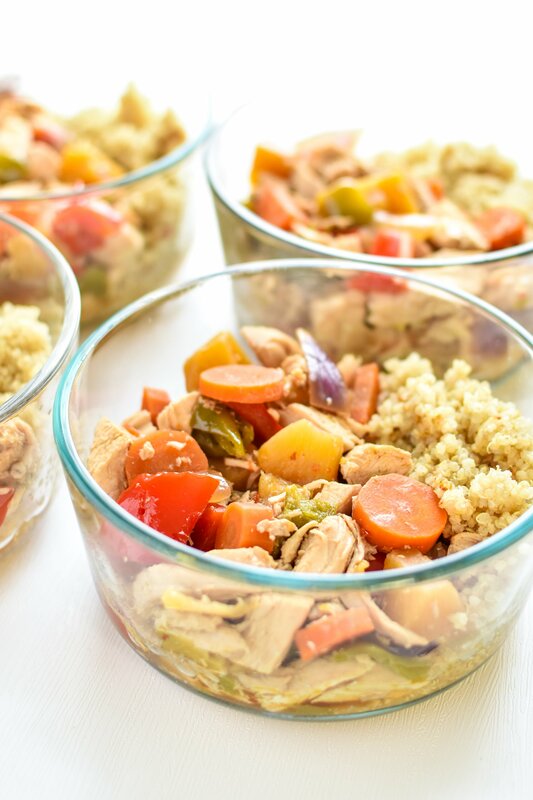 Meal Prep Slow Cooker Chicken Teriyaki Quinoa Bowls are a super simple slow cooker make-ahead lunch packed with juicy teriyaki chicken breast and tons of veggies! Serve with quinoa or your favorite side. Lunch is 100% the most commonly prepped-ahead meal. It makes sense. It’s the meal eaten in the middle of the day when we’re normally away from home. And let’s face it, if you’re away from home without lunch, you most likely end up buying something. If your lunch purchase consisted of anything on the healthy side, it probably cost more than this entire recipe of four lunches. Ouch. 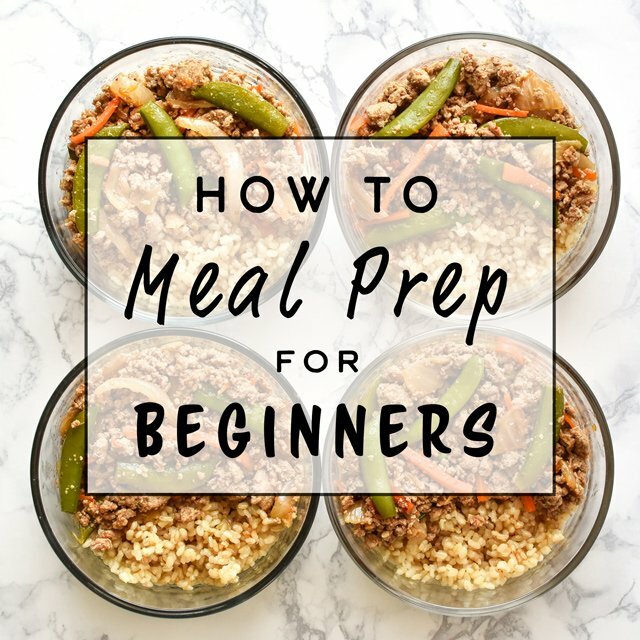 So instead, choose to Meal Prep Slow Cooker Chicken Teriyaki Quinoa Bowls. 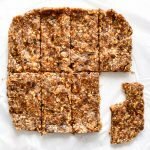 This recipe is perfect for your next Sunday Meal Prep (in fact, I’m planning to add it to this week’s meal plan). 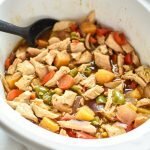 The main component of this super easy recipe is the chicken/veggie/sauce mixture, which is cooked in the crock pot for 3-4 hours. When the chicken has about 30-40 minutes left, I throw the quinoa in the rice cooker so the two are done at about the same time. When the chicken is done, I remove it from the slow cooker, and shred it with two forks. Then I stick it back into the slow cooker to get more chicken surface area touching the yummy teriyaki juices. Another huge bonus on this one: use any of your favorite veggies to make it your own meal. The last few times I made this recipe, I’ve chosen various colors of peppers to change up the flavors and colors. We also love the texture of the carrots after a few hours in the slow cooker. Anything will work! 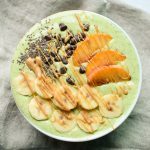 If you happen to be looking for a way to thicken up your sauce, head over to the inspiration for this recipe at Tastes Better from Scratch. 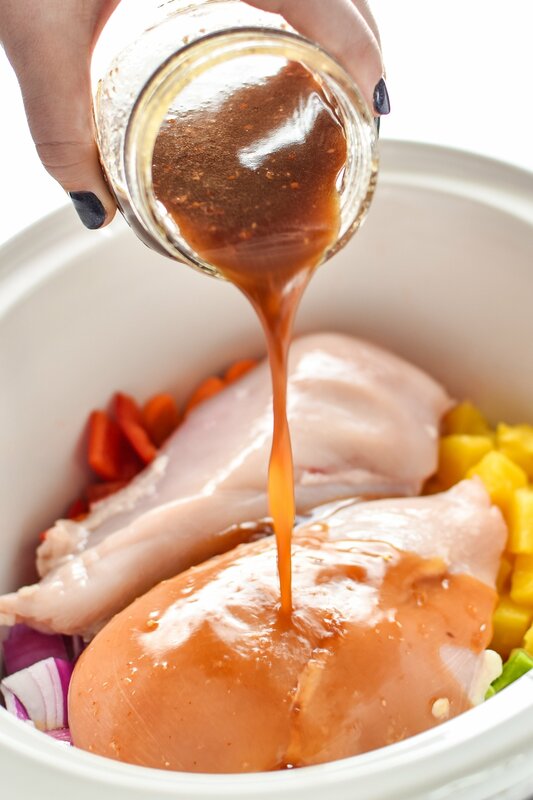 Lauren Allen’s recipe for Slow Cooker Chicken Teriyaki ends up with a thick sauce from the addition of corn starch. While I do love the thickened sauce, I don’t love the extra carbohydrates that come with it. I’ve chosen to omit the brown sugar and corn starch from this meal prep version of lunches. Most teriyaki sauces have a lot of added sugar and sauce thickeners in the form of brown sugar or corn syrup. Since I left that stuff out, I stuck with just a couple tablespoons of honey as a sweetener for the dish, along with the pineapple. Teriyaki has been a big deal in Seattle since before I can even remember, which is why I was so excited to jump on the slow cooker chicken teriyaki train. We used to get it all the time. The meal would come from one of the little teriyaki restaurants set up as an exquisite row of juicy sliced chicken smothered in saucy teriyaki goodness, all over white rice. Oh and if you’re lucky, you get one of those little salads! Okay, so that might have been my least favorite part. But the teriyaki was just delicious. Office lunch, anyone? Not to mention some leftovers for later! So it’s clear I’m pretty into teriyaki. I’m mostly just not into buying it at the restaurant all the time. This recipe solves that problem. Four quality chicken breast teriyaki lunches – at less than half the price of eating out! 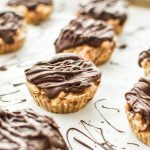 Did I mention the recipe is super easy? Chop some veggies while listening to your audiobook, then dump everything in the crockpot and go (that was me, yesterday). And it’s pretty much guilt free (since I left out the sugar and corn starch!). My conclusion – lunch prep is the most useful prep. 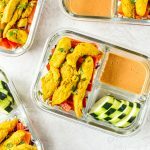 Meal prep a healthy version of a takeout favorite! 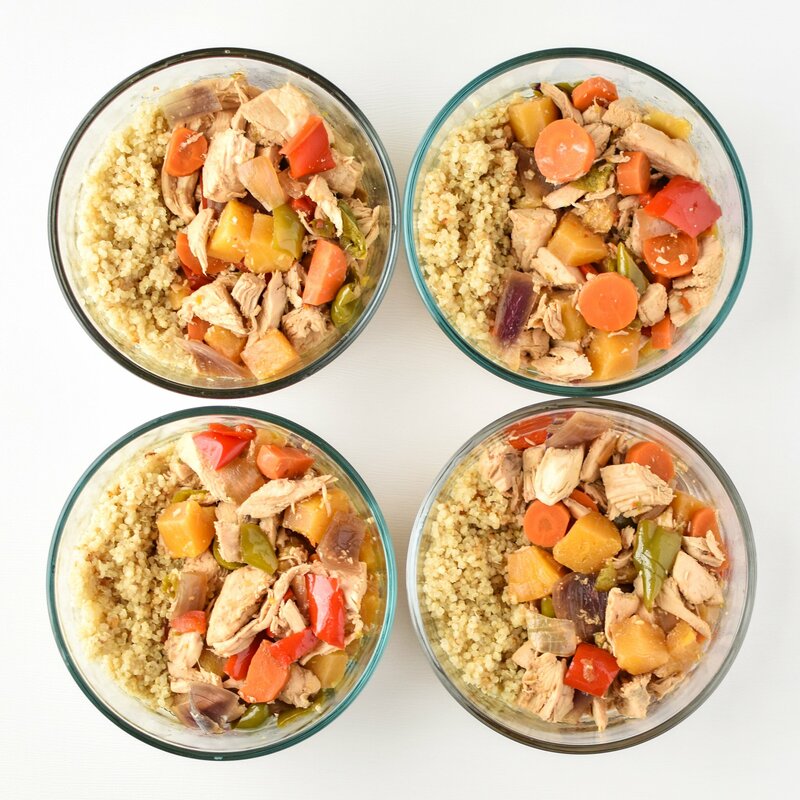 Four meals ready for the week, with chicken, veggies and quinoa. 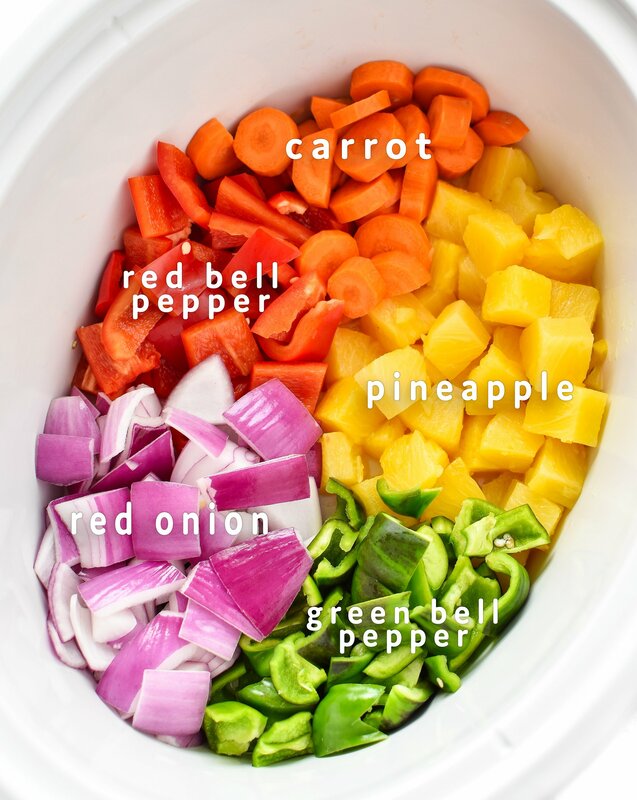 Add the green pepper, red pepper, red onion, carrot, and pineapple to the crock-pot and mix until evenly dispersed. Set the chicken breasts on top of the vegetables. In a medium bowl, mix the soy sauce, pineapple juice, sesame oil, ground ginger, red pepper flakes, honey, and sriracha. Add sauce to the crockpot, covering all chicken, and set on LOW for 3-4 hours. After approximately 3 hours, use a rice cooker to start the quinoa (or use whatever cooking method you prefer). Coat the inside of the rice cooker bowl with coconut oil using a paper towel. Add chicken broth and quinoa to the rice cooker. Set on the brown rice setting. When the internal temperature of the chicken reaches 165 degrees F, remove the breasts from the slow cooker and shred the chicken into bite sized pieces. Return the chicken to the slow cooker and mix well. Let the slow cooker sit on warm for another 10-15 minutes, or until the quinoa is done. When both the quinoa and chicken are done, portion into four airtight containers or Pyrex and use within 4 days. 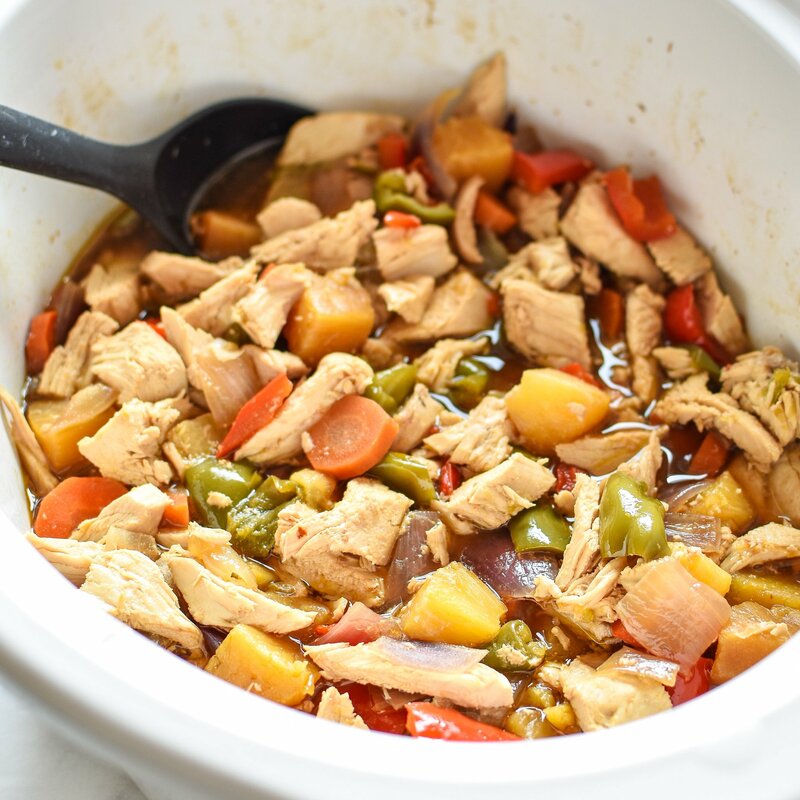 Inspired by Slow Cooker Chicken Teriyaki by Tastes Better From Scratch. 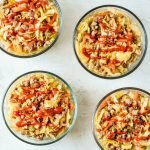 Thank you so much for checking out these Meal Prep Slow Cooker Chicken Teriyaki Quinoa Bowls! Tag @projectmealplan on social media if you meal prep! I’d love to see what you’ve created. 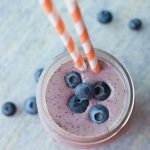 Follow me on Pinterest for meal inspiration every single day. 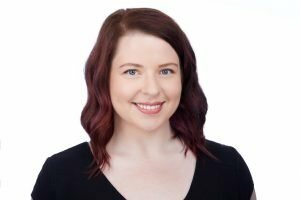 HI Lizzie – I’ve never frozen any parts of this recipe before or after cooking, but I do think the chicken, veggies, and sauce can all be placed in a freezer safe gallon bag when raw and stored for a couple months. Then, perhaps the day before you want to cook it, thaw it out and then toss it all in the slow cooker. I’ve never had frozen quinoa so I’m not sure about that one! Otherwise I hope it all works out!